There is an African proverb which states, “If you want to go fast, walk alone. But if you want to go far, walk with others.” This quote personally resonates with me in many different ways. Whenever I wanted to make a difference in my community, I initially tried to do it by myself and research everything I needed to know about a topic. However, I soon realized that working with team of individuals with diverse perspectives could create a unique solution and make a bigger impact in our community. One of the topics I am most passionate about is education. It disturbs me that many people choose to underestimate the importance of education. I believe that education is what shapes the leaders of tomorrow, and it is something that everyone should care about. In my high school, I have heard students making comments such as, “Why do adults in the education system never listen to the opinions of high school students?” For the longest time, I wondered the same, and thought that it was an important problem to address. With the help of a teacher, a group of similar-minded students convened and decided to make a change. After many hours of drafting and revising, we crafted a resolution, proposing a Student Senate be created, to bring the concerns of students to the Board of Trustees. After extended discussions and questions, the resolution passed and the Student Senate was launched. The Student Senate was responsible for bringing the concerns of different high schools forward and proposing solutions. This was an initiative created by students, for the students in Edmonton Public School Board, to make a difference in their future education. Even though I was already very passionate about education, my passion for grew when visiting Uganda. 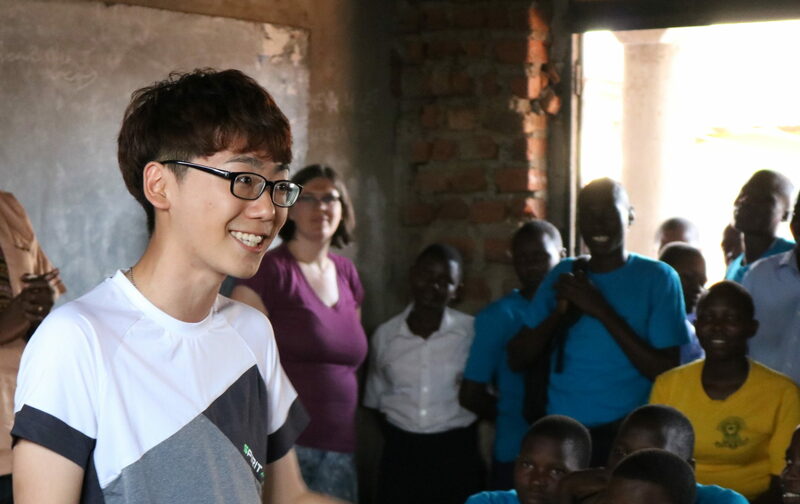 Since I was familiar with the education system in my community, I was excited to learn about Uganda’s education system. I was curious to learn about their access to educational resources, and how their curriculum and school system compared to my own. And many of these questions were answered when we visited Stella Matutina Girls Secondary School. This school works with students of all backgrounds, and creates an environment where they can excel. By making into a boarding school, they eliminated the difficulty of students’ transportation. By bringing counselors and volunteers, they allowed students to share their honest concerns. And finally, by subsidizing and paying for these girls’ tuition, they gave them an opportunity to break the cycle of poverty and teach them how to be self-reliant. When I visited Stella Matutina, students shared their difficult stories. However, it surprised me that even when they experienced many adversities, they still continued to be strong and optimistic in difficult situations. I did not expect that I, a sixteen-year-old Canadian boy, would be inspired by their powerful stories and strong resiliency. Now as you see this video or hear this story, you might think that these are problems and solutions have nothing to do with you. It is true that everyone struggles with different problems in a different way. However, it is also true that no individual can go far without the help of others. Even by just stepping out of our comfort zone to simply listen to their stories, it can make a difference in many peoples’ lives. These students could be the future engineers, doctors, police officers, diplomats, and friends who can work beside you to make the world a better place. And I am glad to have had the privilege of meeting them.